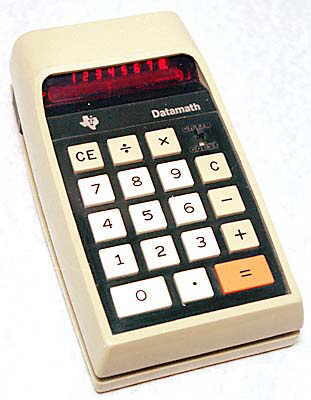 The TI 2500 "Datamath" was Texas Instruments first calculator, launched in early summer 1972. It was very successful and several versions were produced over the next few years. At a quick glance these models look similar, but the differences between the major versions are shown below. TI-2500 "Datamath", 3rd. version and TI-2500B "Datamath". The first version of the Datamath can be distinguished by the combined CE/D key, which is used to Clear the last Entry and to refresh the Display, which extinguishes, except for the first digit, after the calculator has not been used for about 15 seconds. This version is also the only one which has 6 AA rechargeable cells, see photograph below. 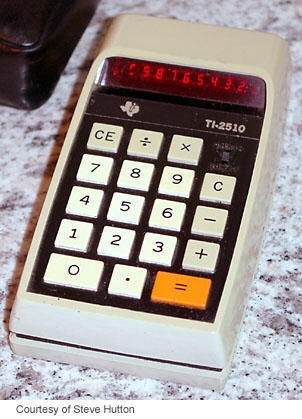 Texas Instruments TI-2500 "Datamath", 1st. version. Distinctive features: The first in a long line of hand-held calculator models sold by integrated circuit manufacturer Texas Instruments. Main integrated circuit - TI TMS0119 (here date coded 7238, i.e. week 38 of 1972). 7.2v (6x AA re-chargeable cells). 74 x 138 x 42 mm (3" x 5.5" x 1.7"). 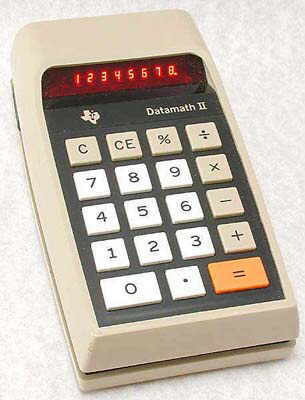 The Datamath was introduced in July 1972 and cost $149.99, but this was soon slashed to $119.95 in September 1972. Made in U.S.A. & UK. This example was made in UK. This was the first calculator manufactured by Texas Instruments. However, Texas Instruments had started research into portable calculators as early as in 1966 with the "Caltech" project. The company was a supplier of calculator electronics to Canon, who's Pocketronic calculator of 1970/71 was a much advanced Caltech design and was one of the first hand-held calculators. By 1972, Texas Instruments had realised the huge potential of the pocket calculator and entered the market with the Datamath. 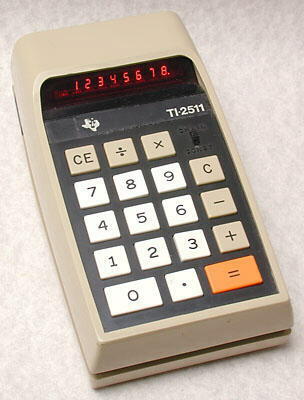 TI is one of the few early manufacturers which is still in the calculator market. The development of the TI-2500 Datamath produced several similar versions, some of which are shown further down this page. The rear of the 1st. 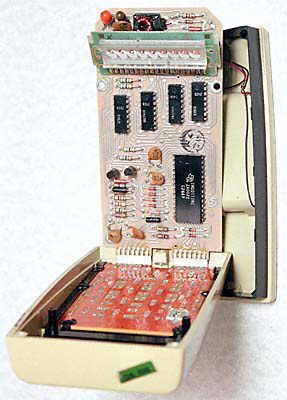 version TI-2500 "Datamath" with the battery compartment cover removed revealing the six AA rechargeable cells used in this model. The 1st. version TI-2500 "Datamath" with the case opened. This shows that the battery compartment, on the left, takes up the bulk of the volume inside. On the right is the top half of the calculator showing the rear of the keyboard, against which the battery compartment fits. The electronics, including the TMS0119NC calculator chip, is squeezed in around the display, top right. Here the display board has been pulled up to show the LED arrays of the display, together with two SNSN75492 LED driver chips. The second version has a key marked CE only. It uses only 4 AA rechargeable cells. Texas Instruments TI-2500 "Datamath", 2nd. version. Main integrated circuit - TI TMS0119 (here date coded 7343, i.e. week 43 of 1973). 4.8v (4x AA re-chargeable cells). This example was made in U.S.A. The rear of the 2nd. 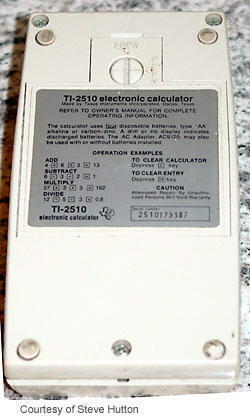 version TI-2500 "Datamath" showing that there is no battery cover for removal by the user. The 2nd. version TI-2500 "Datamath" with the case opened. 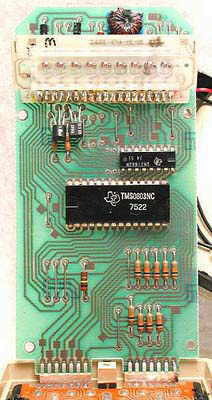 The electronics of this version is similar, but not identical, to the 1st version and is mounted on a full sized circuit board behind the keyboard. The 4 AA rechargeable cells are attached to the base. There was an LCD version of this calculator which was produced in prototype form as the Minimath, as shown on the left, but it was never marketed. For more information see the "TI Prototype Found" article. The TI-2500 "Datamath", 3rd. version and TI-2500B "Datamath" are very similar and both can take replaceable batteries in the battery compartment. The TI-2500 3rd. version and the TI-2500B appear to be identical apart from the model number printed on the label on the back. Unfortunately, all the printing has been rubbed off the label on the machine illustrated, so it is not possible to determine which of these two models it actually is. Main integrated circuit - TI TMS0119 (here date coded 7449, i.e. week 49 of 1974). Uses either 3x AA re-chargeable cells or 4x AA disposable cells. The rear of the 3rd. version TI-2500 or TI-2500B with the battery compartment cover removed. Unusually, it takes four AA disposable cells, or only three rechargeable cells. The circuit board of the 3rd. version TI-2500 or TI-2500B. Texas Instruments TI-2500-II "Datamath II". The TI-2500-II "Datamath II" uses new electronics in the old style casing, and the keyboard now has a "%" key. Main integrated circuit - TI TMS0803NC (here date coded 7522, i.e. week 22 of 1975). Uses 2x AA disposable cells. This example was made in Italy. 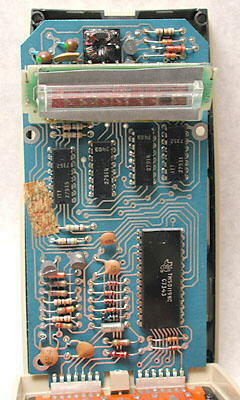 The circuit board of the TI-2500-II "Datamath II". Is similar to the TI-2500 3rd. version and the TI-2500B. Uses 4x AA disposable cells. The TI-2511 is similar to the TI-2500 3rd. version and the TI-2500B. The circuit board of the TI-2511.